This is one page of a larger product. Help yourself to this free worksheet and see how your kids like it. I think Santa's little helpers will have fun filling the stockings. 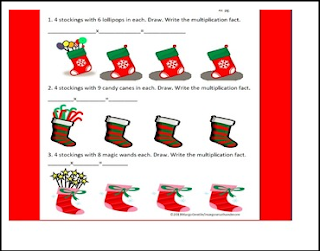 If you're working on multiplication, especially the "4" facts, this worksheet should be perfect. The read-draw-write concept is very similar to my "Martian Multiplication and More" packet as well as my "Juggling Jackolanterns" packet. Have fun!